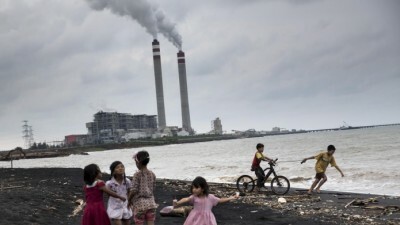 Paris, France, January 3, 2017 – In a move welcomed by Friends of the Earth France, Société Générale has confirmed that it will not finance the Tanjung Jati B 2 (TJB2) coal plant project in Indonesia. It has become the second French bank, following a decision from BNP Paribas in 2015, to withdraw from the controversial TJB2 project that would heavily impact the climate and the health of Indonesians. Friends of the Earth France is now calling on Crédit Agricole to also withdraw from TJB2 financing as well as from the Cirebon 2 coal plant project in Indonesia to help prevent potential impacts at both projects and to ensure that the bank respects the commitment it made only in October last year to end its financing of all new coal-fired power plant projects around the world. Société Générale’s commitment in October 2016 to no longer finance new coal-fired power plant projects entered into force on January 1 this year, thus the bank is no longer able to finance the TJB2 project in Indonesia. The project, which would be incompatible with a 2°C climate pathway and which one study has suggested may lead to the premature deaths of 1200 people , failed to reach financial closure before the beginning of 2017 in order to guarantee the participation of Société Générale, one of six banks – including Crédit Agricole also – which has been considering finance for the project. At the end of December, Crédit Agricole published a new policy on coal-fired power plants which enacted the October commitment not to finance new power plants and also outlined that it would no longer support companies which generate more than 50% of their electricity from coal. Friends of the Earth has analysed this policy and also published a study on the compliance of Cirebon 2 with Crédit Agricole’s social and environmental commitments. The conclusion of the analysis: if the new policy is weak and insufficient to meet the climate targets, financing Cirebon 2 would be a clear violation of the Equator Principles of which the bank is a signatory .